Vanport, Oregon’s second largest city, with a population nearing 22,000 in the mid 1940s, was located near the Portland International Raceway. It was wiped off the face of the earth on May 30, 1948. Vanport was dramatically destroyed at 4:05 p.m. on May 30, 1948, when a 200-foot (61 m) section of the dike holding back the Columbia River collapsed, killing 15 and making the entire population of 18,000 homeless. The break was in the lower portion of photo (above), along the railroad berm. The current I-5 bridge and Columbia River are off the page on the left, top. Denver Avenue (near the current I-5) is just above the top of the photo. The break in the dike was near the confluence of two railroad tracks, on land that is now on Heron Lakes Golf Club, along the North/South Railroad birm. Vanport was completely overwhelmed by the Columbia’s high water in a matter of hours. Because of the holiday, many residents were away from their homes for the day, contributing to only 15 deaths. The city was a complete loss. 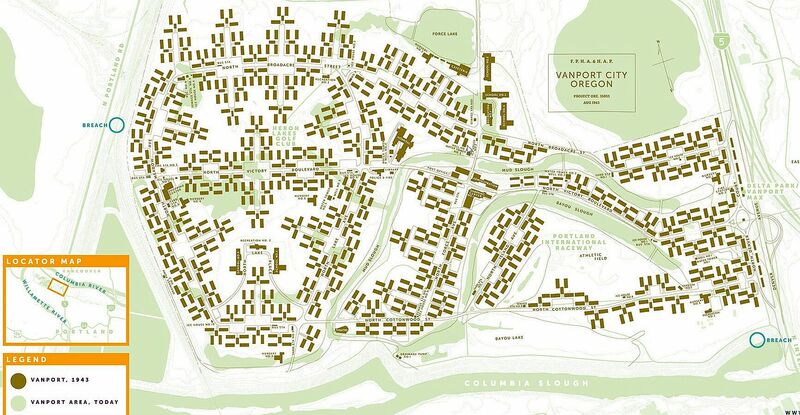 The Housing Authority of Portland started work in Vanport City, in 1942, building apartment buildings near the Columbia River where PIR and Delta Park are now located, on land that Henry Kaiser had originally purchased on the Columbia Slough. About the same time, HAP started building Columbia Villa, a large housing development in North Portland, as well as other housing around the city. In just two years, the agency reportedly provided housing for seventy-two thousand people who worked in the shipyards and related industries. More than 100,000 people called the community home between 1943-1948. Vanport was also home to returning World War II veterans, returning Japanese internees and Vanport College, which became Portland State University. The Heppner flood of 1903 destroyed a large portion of Heppner, Oregon, on June 14, 1903. With a death toll of 247 people, it remains the deadliest natural disaster in Oregon. Today, the Multnomah County Drainage Districts actively manage the Columbia River and Columbia Slough levees to prevent flooding and drain the floodplain area. Vanport Mosaic Trailer from Vanport Mosaic. Vanport Mosaic is an effort to collect and showcase all of the stories, art, and media produced about Vanport to ensure that this piece of Oregon history is not forgotten.